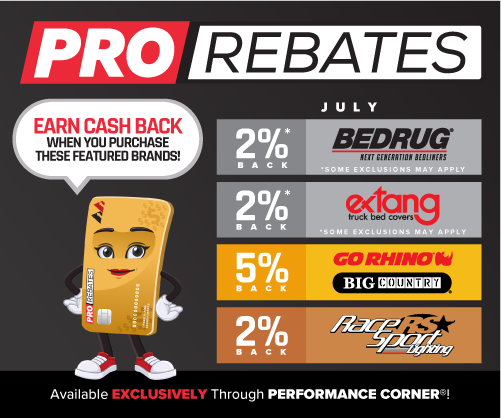 Offered exclusively through your Performance Corner® warehouse distributor, the PRO Rebates™ program gives you cash back on your purchases of certain vendors during special promotional periods throughout the year. With rebates ranging from 2 to 5%, the more you buy, the more you get back! Rebates are automatically mailed to you in the form of prepaid Visa debit cards to spend as you see fit. Sign Up: Log in to your Insight™ account at accounts.theaamgroup.com and click on My Profile at the very top center of the page. Ensure that your store’s physical address, email address, and WD account number(s) are correct. If you don’t have an Insight™ account, create one for free at performancecorner.com/rs; it’s secure, easy, and takes less than 5 minutes. Participating Vendors and Periods: Before a new promotional period begins, we’ll send you an email and a postcard announcing the highlighted vendors and their associated cash-back percentages. Buy from Your Performance Corner® WD: Start enjoying automatic rebates by purchasing featured brands from your Performance Corner® warehouse distributor. That’s it! Sign Up If you're already signed up, you're all set!